You might have noticed that we've been attempting to sell t-shirts lately. I thought I'd dedicate a post to explain how I'm doing it and why I decided to do it this way. I've had a few requests over the years to slap together some sort of Magic City Mayhem merchandise so people can show their MCM pride around the parks. Well, getting something like that going isn't cheap. The obvious approach would be to create a design, find a printer, and buy a whole bunch of shirts to re-sell to our audience. Unfortunately, I don't have the capital to do this right off the bat. But then I discovered TeeSpring. TeeSpring is basically a crowd funding website for shirts and other apparel. I create a design, select the style and color of shirt I'd like to put in on, and then position the design on the shirt. TeeSpring already sets a price which is basically their cut based on the shirt quality and other minor details. I have to raise the price slightly in order to make any profit. But there's also a small catch. (Isn't there always?) I have to tell TeeSpring how many shirts I think I can sell and the amount of time in which I think I can sell them. If I don't hit this goal, they won't print and ship the shirts. 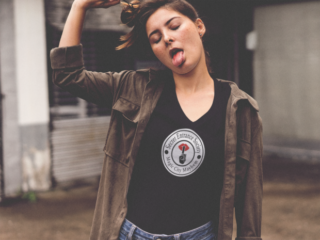 Available now in our TeeSpring store! The "Secret Entrance Society". So lets say I set the goal for a campaign at 10 shirts in 14 days. Even if I sell 9, that campaign doesn't "tip", everyone who ordered the shirt gets their money back, and I have to start over from the beginning and set a lower goal. If I do hit the goal, TeeSpring takes care of all the shipping and handling and everyone who ordered a shirt has their item shipped a few days after the campaign ends. When someone purchases a shirt, it's done pretty much anonymously. I just get a notification that a shirt has been bought, but since TeeSpring handles all the shipping and whatnot, I don't really need to see who actually buys one. I'm trying to figure out a way if it's possible to find out who our buyers are so at least I'd be able to thank them for their support. 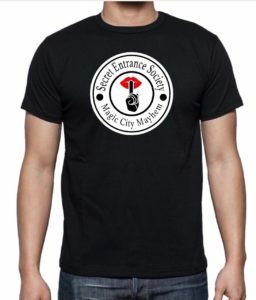 My end goal is to eventually have enough capital to buy a bunch of shirts at a time and sell them off MagicCityMayhem.com. I don't have a true timeline for when I think that will happen, but I'm hoping by early 2018. 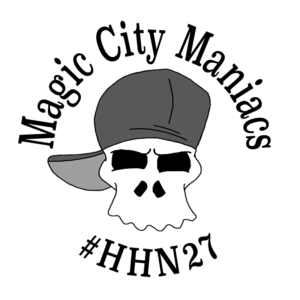 But for now, you can check out our store on TeeSpring and check out some shirts with our logo on it, the Secret Entrance Society logo, and some Halloween Horror Nights inspired designs. We are also hoping to get some magnets with our logos and designs on them to send to people who take photos in the parks whilst wearing their MCM gear. We will announce as soon as that promo starts. But until then, thank you so much to all the Magic City Maniacs who have already purchased shirts from us! It is appreciated more than you know! You guys rock!! Stay tuned for more designs! If you have any questions about our apparel, drop me an email at mikey@magiccitymayhem.com I might even give you a promo code for a small discount! Thanks again, and I hope to see you in the parks! CLICK HERE TO GO TO "SHOP MAGIC" AND SEE WHAT WE CURRENTLY HAVE ON TEESPRING!! !